Stock photo of an iceberg stranded in the harbour of Old Bonaventure, Bonavista Peninsula, Trinity Bay, Newfoundland Labrador, Canada. 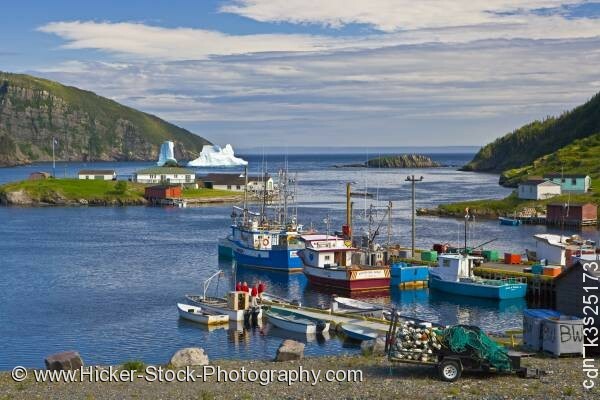 Stock photo shows an iceberg stranded in the distance of the fishing harbour of Old Bonaventure, Bonavista Peninsula, Trinity Bay, Newfoundland Labrador, Canada. The charming fishing harbour of Old Bonaventure has several small fishing boats sitting at its dock. Small rowing boats have their own dock along the harbour. A few buildings sit on a small island not far from the docks. Just beyond the small island a iceberg is stranded in the waters of Trinity Bay. A rocky shoreline with rugged hillsides surround the harbour. The dark blue waters are a wonderful contrast to the lush green foliage of the hillsides. A beautiful day reveals a soft blue sky with large wisps of soft white clouds that hang just above the bay. An iceberg stranded in the harbour of Old Bonaventure, Bonavista Peninsula, Trinity Bay, Newfoundland Labrador, Canada.